I recently deployed a MIM 2016 solution into Production that took about 10 months to build, test and deploy. 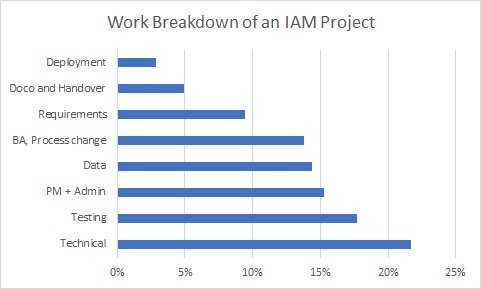 I decided to take a look at the percentage of overall time spent on broad work categories in the whole project, and that’s what this post is about. First I had to get the data on time spent and break it down by work type. This was pretty straight forward for the “Supplier” side (mostly me and a business analyst) as we had detailed timesheet reports. For the customer side I had to do some educated guesstimation. This is how the overall picture came out with explanations below. Unable to get preview XML from server. Trying a couple of times actually led to the Sync Service crashing. I was trying to delete a CSV MA from a MIM sync service. The connector space was empty but all I got was the error “Unable to delete the management agent” and the code 0x8023060c. Nothing in the event logs at all. I was convinced it was something to do with the database and rolled it back a couple of days – no change. I finally decided to start over with a fresh install, re-migrate the config and re-load the data. It was while cleaning up the MaData folder I found my stupid mistake – in another logon session I had the CSV file in the MA’s MaData folder open, so MIM couldn’t rename the folder as part of deleting the MA! Pretty dumb mistake – but a “File locked” error message somewhere would have really helped. Let’s start with a statement that can be made about any design: good design makes sense, it is coherent, it is self-evident and doesn’t need a lot of explanation. While a simple IAM solution would be a fine thing, the reality is that we must deal with complexity in technical connectivity, data, business rules and processes, and what’s more, all these aspects should be expected to change over time. I firmly believe that good solution design means doing everything I can to minimise complexity by, for example, being fastidiously consitent with schema and naming conventions, doing similar actions in a similar way throughout the solution, and keeping all changeable configuration parameters and logic rules in one place. I find the most efficient way to identify poor design is to try and explain, or even better, demonstrate it to someone else. Sometimes just hearing my own explanation is enough for me to think “that sounds ridiculous” – without even having to take their confused expressions into account. Another fantastic way to improve design is to write the Operations Guide. If it takes you 5 pages to explain how to perform an operational task you have done it wrong. The key point is that you should be doing this as part of designing and building the solution. If you leave the demos and operational documentation until you’re at the point of going into production, you’ve left it far too late. Failed to retrieve the schema. For those that just want to know the answer – it had something to do with clear text AD credentials being blocked, and the workaround was to create a SQL account and connect with that instead. Sometimes I want to simulate connectivity from an application another way, usually for troubleshooting or verifying networks and accounts have been set up correctly. One thing that’s always been difficult is testing I can connect to a SQL database in a non-trusting domain, using an AD account in the other domain. I can’t hardcode credentials in the connection string, as that’s only for SQL accounts, and I can’t use RUNAS with the foreign account.